Ellie Washington lost her husband in a tragedy five years ago at Christmas. She wouldn’t have made it through her grief if not for her husband’s brother, Nick, who helped her pick up the pieces of her shattered life. And with every year, her feelings for Nick have grown. Now she realizes she might be in love with him, but that’s not fair, because Nick deserves a life that isn’t about his brother’s widow and son. Sharing his life with Ellie and her son has been the balm that soothed Nick’s soul after losing his brother. Now that friendship has turned into something deeper. Nick doesn’t want to upset the status quo, but someone has to make the first move, and it’s time they figure out if their feelings are real. Nick believes in what they have. He also believes in Christmas miracles, and he thinks they’re both long overdue for one. 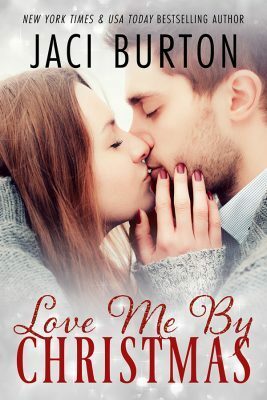 Love Me by Christmas is a sweet, holiday romance by Jaci Burton. The story revolves around Ellie, Nick and four year old Henry, and dealing with the loss of a loved one during the holiday. Five years ago, heavily pregnant with Henry, Ellie’s husband lost his life in a house fire.With no family of her own, John’s brother, Nick, stepped in to help her, as they leaned on one another in the difficult times ahead. Five years have now past and Ellie and Henry still live with Nick. Ellie, a nurse, is thankful for all the help that Nick has provided to her and her son. But lately, the feelings she’s had for Nick have changed into something more and she’s not sure how to deal with it. Feeling guilty, she begins to try and set Nick up on dates with coworkers and when Nick realizes what she’s doing, sabotages her attempts. Nick’s feelings for Ellie have also been changing and he’s not about to lose his chance with the woman he’s fallen in love with. Ellie is trying to run, scared of her feelings for Nick and guilty that he is her husband’s brother and Nick will do everything he can to prove that they belong together. Filled with humor, love, and a sweet romance, this was a nice Christmas novella.